How to flush hot water heater properly and what are the benefits. Why is flushing important for your heater? Step-by-step instructions. How to use vinegar and chlorine to clean and remove deposits. The number one reason for flushing a water heater is to clear the tank from the sediment buildup and other debris. Sediment build-up inside the heater's tank often leads to lower efficiency and performance, or even worse clogged elements, malfunction, and no hot water issue. This is one of the reasons why flushing should be done regularly - at least once a year or often if you live in an area with hard water. Check out what is the hardness of the water in your area here. Flushing a water heater is an easy DIY project that doesn't require any special skills or tools. You don't have to be an electrician or gas technician to flush the hot water heater. Just use the recommended tools, follow the guide and be careful when dealing with the hot water, due to scalding. Flushing a water heater should be done as recommended by the manufacturers. Sediment deposits at the bottom of the heater's tank are the problem as it will affect the normal operation and increase the heating costs. This is especially important for gas heaters, as deposits can form between the heat source (combustion chamber and gas burner) and water, creating something like insulation, so less heat is transferred to water. Also, sediments can create hot spots that can damage the tank and cause the elements to fail or leak. You might even see the residues coming out of the tap. Electric units will have deposits on the heating elements which will reduce the heat transfer, can produce popping or rumbling sound and eventually die. If you haven’t flushed a tank for a long time and planning to drain water using the drain valve, you might get a surprise. Once you open the drain valve, the debris could clog the valve and prevent it from closing. This will force you to replace the element as it would be tough to perform maintenance and service. If the plastic valve was used, you might have to break it into pieces to remove it. Replace it with the durable brass-type valve. Most of the newer models, either from Rheem, AO Smith or Bradford White manufacturers utilize self-cleaning systems to reduce the risk of the buildup, but still, regular flushing is recommended. The most critical step when flushing a water heater, either gas- or electric-powered, is to turn the power OFF (gas and the circuit breaker). Open the nearby hot water tap and leave it open for draining, until the temperature goes below 100 F, to reduce the risk of scalding burns. Shut OFF the water supply to the heater. Use the garden hose and attach one end to the drain valve located at the bottom of the unit and the other end to an open drain or outside the house. 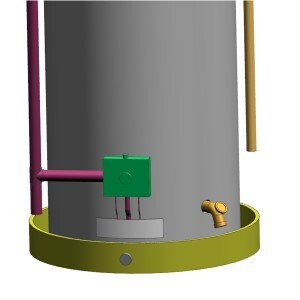 Open the TPR valve at the top of the unit and drain valve at the bottom. Once all the water is drained, and sediments flushed away, close the drain valve and TPR. Flush the hot water heater as much as needed to remove the deposits. Open the nearby hot water tap and manual shut OFF valve to let the cold water fill the tank. Once the steady stream of water is established from the faucet turn it OFF. Resume the power. For the electric unit, turn the breaker on and increase the temperature on the thermostat, and for the gas type, check out the instructions found on the sticker on the heater how to relight. Sometimes it is needed to flush the hot water heater several times. During the flushing, you will see white particles coming out through the drain valve... this is normal. Flush hot water heater often, at least once or twice a year or based on the quality of the incoming water. Turn off the gas, electricity, and water. Open the hot water tap to release the pressure in the tank. Connect a garden hose to the drain valve, open the valve and let it drain completely, then close the valve. Disconnect the cold water inlet, how water outlet and TPR valve, all located at the top of the heater. If you have an electric unit, remove the heating elements. Pour one gallon of the vinegar into the tank using the funnel and over the heating elements. Wait at least 6 hours before cleaning what’s left. Reconnect the inlet, outlet extension, and TPR valve. Open the drain valve and turn on the water to flush out the dissolved sediments and vinegar. Do as much as needed, because it takes time to eliminate the vinegar odor. Close the drain valve, open the shut-off valve and fill the tank with water. The tank is full when you see the water coming out the tap. Close the tap and restore power to the water heater. Flushing a water heater with chlorine is the procedure we use to eliminate bacteria that is found in water heating systems. What indicates that there are bacteria, is the rotten egg odor and discolored water. Connect a garden hose to the drain valve and open it to empty the tank. Once emptied, close the valve. Add one gallon of chlorine for every 25 gallons of water, using a funnel. Put the anode rod back in. Open the water supply to refill the tank. Since every water line in the house must be treated, open every faucet, one by one, until you smell the chlorine. Let the chlorine sit in the system for at least one hour. Drain and flush the tank as many times as needed until water is clear and chlorine is removed from the system. How to prevent sediment buildup issues? If you live in the area where water is very hard you might have to flush it more often. Installing a water softener is a good idea to prevent mineral build-up, while a deliming solution, such as phosphoric acid at a food-grade level, will dissolve the sediments so it can be flushed away from the heater. You can also flush the tank if hot water is discolored or contains chlorine odor after chlorination procedure, which was used to eliminate various bacteria accumulated in the heater. As it can be seen, water heater flushing is not a big deal, and it is beneficial. This is a DIY project and doesn’t require any special skills. So don’t worry, it doesn’t have any downsides, just the benefits.